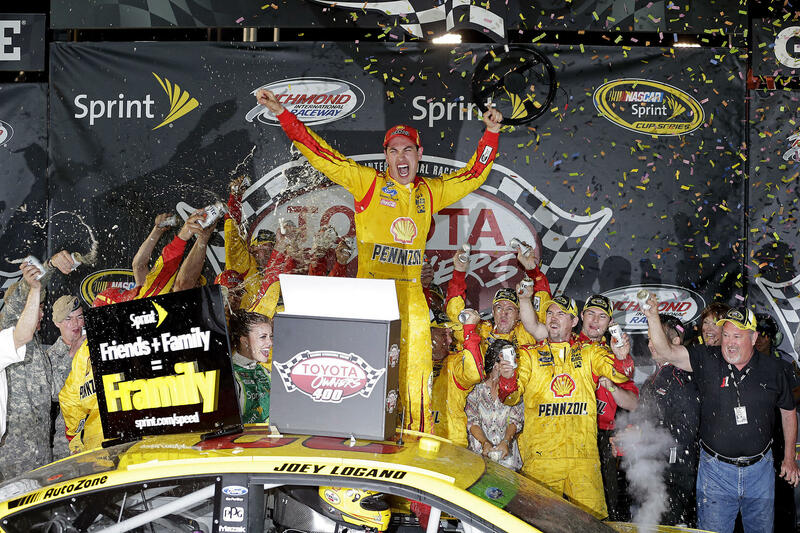 RICHMOND, Va.— Joey Logano was penciled into a spot in the Chase for the NASCAR Sprint Cup. Now you can write his name in indelible ink. Capitalizing on beating and banging among competitors in front of him during the final nine-lap run, Logano surged from the fifth starting spot on the final restart to his second victory of the season in Saturday night’s Toyota Owners 400 at Richmond International Raceway. Logano’s victory was his first at Richmond and the fifth of his career. Jeff Gordon came home second and retained the series lead by five points over Matt Kenseth, who ran fifth after tangling with fourth-place finisher Brad Keselowski while battling for the win in the closing laps . On fresh tires after a late pit stop, Kyle Busch drove from 16th to third in the final run. It was a race that had everything, from a spin by polesitter Kyle Larson in the first corner of the first lap (after contact from Clint Bowyer’s Toyota), to right-side tires that corded under stress and turned the wheels into flame throwers, to fiery tempers that continued after the checkered flag. Keselowski and Kenseth swapped sheet metal and exchanged pleasantries on the cool-down lap. Casey nineteenth-place finisher Casey Mears shoved 18th-place Marcos Ambrose after the race—a carryover from a late racing incident—and in return took a right hook that wobbled him. Logano, on the other hand, could barely contain his elation as he climbed from his car in Victory Lane. “I had a terrible restart the one before the last one (on Lap 382), and then we had a good one (on the final restart on lap 392), but the 88 (Dale Earnhardt Jr.) in front of me didn’t have the best, and once we started racing there were three cars in front of me and I thought I had a shot still,” Logano said. “The 20 (Kenseth) started blocking the top because the 2 car (Keselowski) was so fast up top for the first 10 laps of a run, and eventually I had enough room to turn up underneath him and get enough clean air on the car to take off. Earnhardt, who finished seventh after experiencing late brake problems, won a race off pit road under caution for Ricky Stenhouse Jr.’s fiery right front tire and led the field to green on Lap 305. One lap later, however, Logano passed Earnhardt for the top spot and pulled out to a lead of more than a half-second, with Penske teammate Keselowski in tow. But Gordon won a drag race against Keselowski through Turns 3 and 4 to grab the second spot on Lap 332. Six laps later, Gordon passed Logano for the lead as the No. 22 Ford began to fade. During that green-flag run, however, Kenseth began to assert himself, driving from sixth on the Lap 305 restart to the lead on Lap 362. Five laps after Kenseth wrested the top spot from Gordon, Jimmie Johnson’s tire issue in Turn 2 caused seventh caution and brought the field to pit road for fresh rubber. Kenseth was first out of the pits for a restart on Lap 367, but on the restart lap, Denny Hamlin spun in Turn 3 to bring out caution No. 8. After two more cautions, Logano came from fifth to first after the final restart to win the race. After the checkered flag, Keselowski was quick to express his displeasure with Kenseth. For his part, Kenseth made no apologies for trying to win the race. “He was mad because I ran into him a little bit getting into (Turn) 3, but we’re going for the win,” Kenseth said. “I ran him up to the third groove or so, but I’ve witnessed him racing that way a lot, like I think he did to Jimmie (Johnson) at Texas a few years ago. 1. (17) Joey Logano, Ford, 400, $274081. 2. (25) Jeff Gordon, Chevrolet, 400, $220211. 3. (19) Kyle Busch, Toyota, 400, $187666. 4. (2) Brad Keselowski, Ford, 400, $162258. 5. (12) Matt Kenseth, Toyota, 400, $159261. 6. (14) AJ Allmendinger, Chevrolet, 400, $122448. 7. (13) Dale Earnhardt Jr., Chevrolet, 400, $104065. 8. (18) Ryan Newman, Chevrolet, 400, $98890. 9. (16) Carl Edwards, Ford, 400, $104165. 10. (22) Martin Truex Jr., Chevrolet, 400, $116173. 11. (5) Kevin Harvick, Chevrolet, 400, $126548. 12. (6) Brian Vickers, Toyota, 400, $118740. 13. (7) Jamie McMurray, Chevrolet, 400, $118504. 14. (4) Kasey Kahne, Chevrolet, 400, $99565. 15. (26) Greg Biffle, Ford, 400, $125565. 16. (1) Kyle Larson #, Chevrolet, 400, $122085. 17. (15) Aric Almirola, Ford, 400, $119201. 18. (11) Marcos Ambrose, Ford, 400, $108335. 19. (34) Casey Mears, Chevrolet, 400, $105823. 20. (33) David Gilliland, Ford, 400, $104798. 21. (31) Justin Allgaier #, Chevrolet, 400, $100823. 22. (28) Denny Hamlin, Toyota, 400, $88890. 23. (21) Kurt Busch, Chevrolet, 400, $77190. 24. (9) Paul Menard, Chevrolet, 400, $107654. 25. (20) Tony Stewart, Chevrolet, 399, $114948. 26. (43) Landon Cassill(i), Chevrolet, 398, $76765. 27. (27) Austin Dillon #, Chevrolet, 398, $125351. 28. (24) Alex Bowman #, Toyota, 398, $89237. 29. (30) David Reutimann, Ford, 397, $79465. 30. (37) David Ragan, Ford, 396, $88690. 31. (8) Ryan Truex #, Toyota, 396, $79065. 32. (10) Jimmie Johnson, Chevrolet, 396, $129851. 33. (23) Michael Annett #, Chevrolet, 396, $78290. 34. (35) Danica Patrick, Chevrolet, 395, $83665. 35. (38) David Stremme, Chevrolet, 395, $75465. 36. (32) Travis Kvapil, Ford, 394, $75285. 37. (41) Joe Nemechek(i), Toyota, 391, $83146. 38. (29) Ricky Stenhouse Jr., Ford, 390, $106005. 39. (39) Josh Wise, Chevrolet, 390, $66180. 40. (42) JJ Yeley(i), Chevrolet, Engine, 380, $62180. 41. (40) Cole Whitt #, Toyota, 367, $58180. 42. (36) Reed Sorenson, Chevrolet, Electrical, 225, $54180. 43. (3) Clint Bowyer, Toyota, Suspension, 159, $91071. Average Speed of Race Winner: 93.369 mph. Time of Race: 3 Hrs, 12 Mins, 47 Secs. Margin of Victory: 0.946 Seconds. Caution Flags: 9 for 66 laps. Lead Changes: 20 among 8 drivers. Lap Leaders: 0; B. Keselowski 1-31; K. Harvick 32-42; T. Kvapil 43; K. Harvick 44-55; B. Keselowski 56-101; L. Cassill(i) 102; J. Gordon 103-165; B. Keselowski 166; J. Gordon 167-172; B. Keselowski 173-208; J. Gordon 209-227; J. Logano 228; J. Gordon 229-242; J. Logano 243-251; J. Gordon 252-298; D. Earnhardt Jr. 299-305; J. Logano 306-337; J. Gordon 338-361; M. Kenseth 362-396; J. Logano 397-400. Leaders Summary (Driver, Times Lead, Laps Led): J. Gordon 6 times for 173 laps; B. Keselowski 4 times for 114 laps; J. Logano 4 times for 46 laps; M. Kenseth 1 time for 35 laps; K. Harvick 2 times for 23 laps; D. Earnhardt Jr. 1 time for 7 laps; L. Cassill(i) 1 time for 1 lap; T. Kvapil 1 time for 1 lap. Top 16 in Points: J. Gordon – 341; M. Kenseth – 336; C. Edwards – 313; Kyle Busch – 310; D. Earnhardt Jr. – 309; J. Logano – 292; B. Keselowski – 287; J. Johnson – 282; R. Newman – 272; B. Vickers – 256; G. Biffle – 256; A. Dillon # – 252; K. Larson # – 251; D. Hamlin – 245; T. Stewart – 243; M. Ambrose – 242.